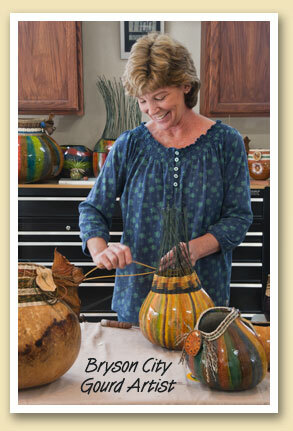 Bryson City artist Joan Glover practices a craft that is as old as mankind — fashioning hard-shell gourds – “nature’s pottery” – into beautiful, functional vessels. In a few short years, what began as a gourd birdhouse hobby has grown into a full-time craft enterprise that takes Joan to major craft shows throughout the region. Her creations combine gourds with just about anything natural — feathers, philodendron sheaths, jacaranda pods, wooden beads, basketry and tillandsia air plants. And nothing is wasted. The gourd tops become vases or wind chimes, and the parts she can’t use are recycled. Another artisan uses the dried pulp in her handmade papers. And the seeds go back into the ground to grow more gourds. You can see examples of Joan’s creations on her website. Or visit Sleepy Hollow Farm where she and husband Mike market organically-grown produce and farm-fresh brown eggs in Bryson City.